The Regulatory Reform (Fire Safety) Order has changed the way in which we work in the fire industry, especially in relation to how companies manage staff competence levels. It is important that both companies and staff working within the fire industry are able to prove this competence through training and certification as experience alone is not deemed sufficient. 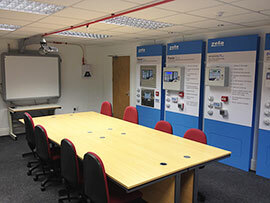 Zeta Alarm Systems offer a dedicated support team who are able to assist with your training requirements. Utilising our long years of experience in working with engineering staff of widely differing calibre we have produced a range of carefully focussed modular-step based training courses. These courses are designed to confidence to engineers and cover product-specific operations as well as the all-important good-practice fundamentals. Training courses are in a number of locations to assist travel arrangements including at Swansea (UK) and Dubai in the UAE. Attendees sit a test after each module and are eligible to receive a Certificate of Competence if they are able to demonstrate a reasonable level of understanding.